D2 Center students, please join us on Friday, January 3, from 1-4 PM for a party to celebrate the new year, a new semester, and sadly to say goodbye to our YANs Cathy Curry and Patrick Taylor. Stop on by for food, drinks and fun! 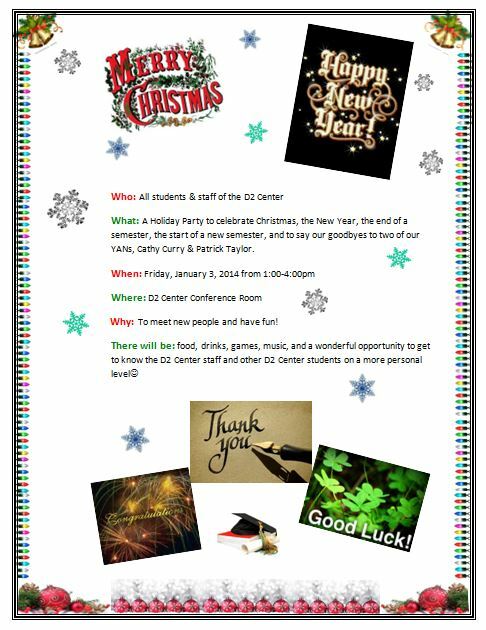 UPDATE 1/07/2014: This was a great event; check out photos on our D2 Center Students Page on Facebook.